With the videos getting booming, people like to visit Facebook not only for its function to connect you and your friends, classmates or family, but also for its huge collection of video clips. Many of them want to download videos from it to get rid of the buffering and slow streaming, even though not all video formats for Facebook are compatible to Mac iPhone iPad and Android devices. If you wanna playing Facebook videos on these devices, an extra step, convert Facebook videos to MP4 needed to be done. 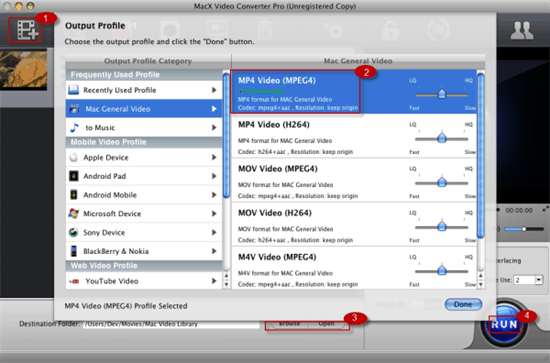 MacX Video Converter Pro, a 2-in-1 FaceBook video transcoder by FB video link, could free download videos from Facebook, YouTube, Dailymotion, Vimeo and many more 1000+ video sharing sites without a hitch, same time convert Facebook video to MP4 format, as well as FaceBook to MP3, 3GP, AVI, MKV, MOV, M4V etc. compatible to iPhone iPad Android devices. With one click, you can convert online FB videos to Android, iPhone Xs, iPhone X/8/7, iPad Pro, iPad Mini 4/Air 2, Samsung etc. to watch limitlessly and wirlessly on the move. 1 Copy the Facebook video URL and paste it on the message box. 3 Hit "Go" button to analyze the video details and then this FaceBook video converter starts the Facebook video to MP4 process. Which is the Better Way to Convert FaceBook to MP4? If you opt for more stable and smoother downloading and converting process, better video quality and fast speed, the specific FB video converter and downloader is more worth to recommended. MacX Video Converter Pro naturally becomes the first choice for this task as the highly rated function of downloading and converting Facebook videos with fast speed and no quality loss. 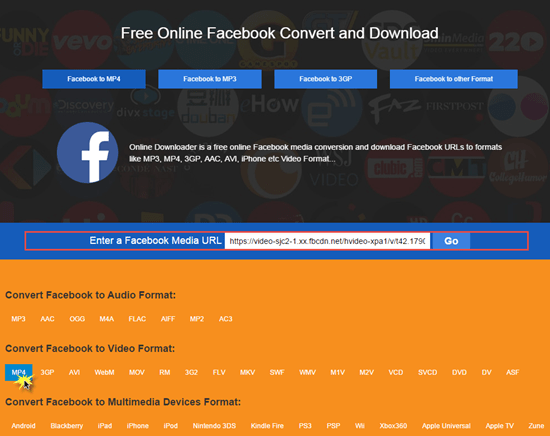 Right now are you curious about the download and convert steps with the terrific Facebook video converter and downloader? Step 1: Free download the Facebook video converter (Windows version) or Mac version (macOS Mojave) and run it. Click "YouTube" button to enter the download interface. And "Add Link" button to prepared for the downloading. Copy and paste the ideal Facebook URL to the message box and click "analyze" to detect the video details. Step 3: Click "Browse" button to specify the output path for the Facebook video. And check "Auto add to convert list" for a preparation of later Facebook video to MP4 conversion. Step 4: Hit "Download Now" to start the downloading task. Step 1: Import the Facebook video. Click "Add Files" to add Facebook video to the convert list or automatically add it during the downloading process above. Step 2: Choose MP4 as the output formats for Facebook video. 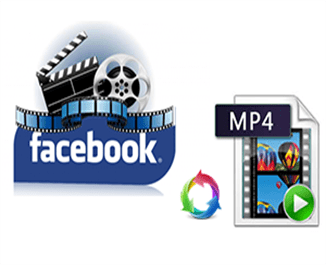 Surely, you can also convert the FLV Facebook video to MOV, M4V etc. any formats your device supported. Step 3: Click "Browse" to decide where you'd like the save your converted Facebook video. Step 4: Hit "RUN" to start the Facebook video conversion process. Any Facebook video converter to help convert Facebook video to MP3/MP4, or convert videos for Facebook upload? Here are the top free video covnerter for Facebook that can convert any video from/to Facebook. It's easy to convert WLMP to MP4 if you choose the right free WLMP file converter. Follow our detailed guide to fast convert WLMP to MP4 on Mac and Windows for playback, editing or uploading to YouTube, FaceBook etc. MacX Video Converter Pro is the best Facebook video converter and dowloader which can easily download and convert Facebook videos to MP4 for Android/iOS. This feature-rich video downloader also can help you download 8K 4K movie/videos/music free from other 1000+ online sites.